CryptoRobot365 Review – Viral Bitcoin Auto Trader Scam! A malicious and deceptive cryptocurrency auto trader know as CryptoRobot365 has contaminated the Bitcoin arena with unrealistic expectations and overwhelming financial losses. Hosted at CryptoRobot365.com, this cryptocurrency investment venture has accumulated a large mass of victims in its wake. While shady affiliates and review sites continue to boast about how great of an investment software that CryptoRobot365 allegedly is, the truth behind CryptoRobot365 has finally started to make some headway. Defrauding hundreds of online investors, it comes to no surprise that CryptoRobot365 has accrued some negative baggage found in the form of user testimonials. While authenticated investor feedback has started to combat the vile nature of the CryptoRobot365 scam, it is evident that the creators behind this operation will stop at nothing to cheat as many investors as possible. If you have been considering dishing out a minimum investment with this cryptocurrency investment software, we implore you to read our conscientious review in its entirety before you not only suffer financial hardship, but also loss of personal information to this scam. CryptoRobot365.com is a CFD and Forex auto trader tailored toward the cryptocurrency domain. Supporting numerous cryptocurrencies such as Bitcoin, Ethereum, Litecoin and Ripple, it shouldn’t come as a shock to most investors about how this auto trader is not synced with any regulated brokerages. One common variable we have noticed between auto trading software that turn out to be scams would be how they are only offered through unregulated broker deposits. The same can be said in the case with the CryptoRobot365 where it gets advertised as a “free” software but in reality requires a minimum investment amount of $250. While the customer support staff will claim that the money you deposit into the brokerage is yours, investor feedback speaks contrary to their promises. Several reports of not being able to execute withdrawals from brokerages have been reported, which is what you can expect to deal with when you invest with unregulated brokerages. The CryptoRobot365 auto trader becomes available to investors once they have completed both registration and broker deposit protocols. After investors complete the initial sign up phase, they will receive access to the software where they will have the ability to manipulate several investment indicators, supported assets, desired time frames along with type of trading method the software automatically generates signals with. While this type of software platform may appear to empower the user, no evidence has been provided that these trading parameters are actually performed by the software. There are quite a few red flags that cannot be overlooked when breaking down the CryptoRobot365 auto trader. Elementary mistakes such as sponsoring a fake “Best 2016 Performance Robot” badge when a whois.com report will reveal that the site was created on July 10th, 2017 is foolish at best. Other deceptive measures pursued by the creators behind this scam would be incorporation of fictitious trader testimonials featured on their platform. 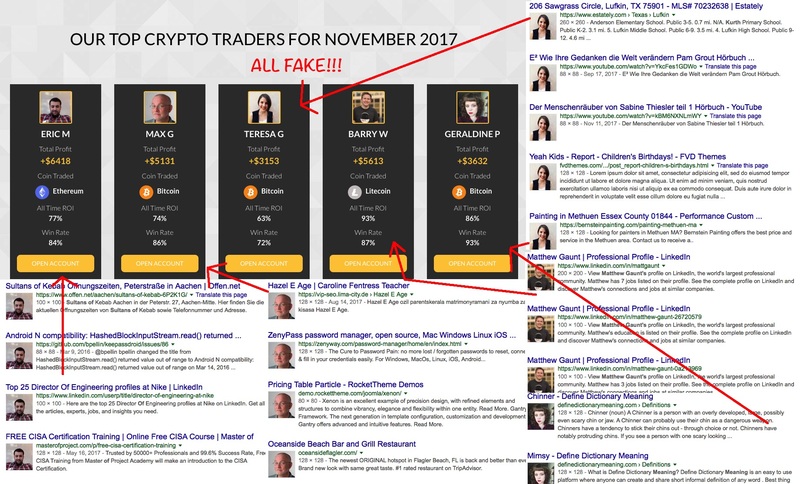 While none of the investor testimonials featured at CryptoRobot365.com are real, we again cannot ignore the fact that this auto trader is functional only with blacklisted and unregulated brokerages. If you are truly convinced that CryptoRobot365 isn’t a scam then we encourage you to search “CryptoRobot 365 scam” into any search engine and soak in the truth revolving around this auto trader. After all the deceptive characteristics we have exposed about CryptoRobot365 the answer would be a resounding no. It goes without saying that the creators don’t care about your well-being as long as they are lining their own pockets through your deception. Due to the relentless efforts of scam artists, CryptoRobot365.com has experienced exponential growth over the past few months. As of December 4th, 2017 the CryptoRobot365 site possessed a SimiliarWeb global rank of 751,308 while over 40% of the sites traffic comes from referral and email based sources. Though not very popular at the moment, the CryptoRobot365 scam is even promoted by Google ads at the moment, making it highly dangerous since people tend to trust ads provided via Google. Avoid the CryptoRobot365 auto trading scam for cryptocurrency investing! Every component featured at CryptoRobot365.com is fabricated and misleading with the sole intentions of soliciting deposits out of inexperienced investors. Investing with untrustworthy investment softwares like CryptoRobot365 will only result in the loss of your personal and financial information along with the supplementation of unneeded stress. Review Verdict: CryptoRobot365 is a SCAM! Not sure which avenue to pursue when it comes to making an investment through cryptocurrencies? Learn about tried and tested investment opportunities by visiting our Cryptocurrency Day Trading Center! Have you been scammed by CryptoRobot365? Please share any feedback you may possess by leaving a comment below this review. Do you have anything on David Simmons? Just Google “David Simmons scam.” There are plenty of scam reports on this person.